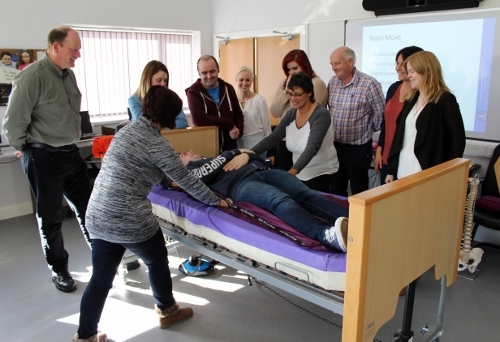 At Advanced Seating Solutions we understand the importance of ensuring that care staff are well trained in all essential areas of practice. In order to prevent people from receiving unsafe care and treatment and to prevent avoidable harm, Providers of Care “must make sure that staff have the qualifications, competence, skills and experience to keep people safe.” CQC Health & Social Care Act 2008 Regulation 12. This is why we offer a wide range of training, delivered to the highest standards, by our experienced trainers. They are clinicians and therapists who have worked in a variety of settings including elderly care, mental health, learning disabilities and paediatrics. Our flagship training package – Back on Track Safer People Handling Training, is a level 1 and 2 manual handling course, aimed at those working in any residential setting, supported living setting, Day Centre or to PA’s and carers, commissioned privately by the person, requiring the care in their own home. Here, our emphasis is on developing consistency of safe care for residents and clients. By applying skills and methods taught on our training courses, organisations will benefit from more motivated staff as well as improved safety and well-being of their clients. Contact us today for more information and to find out more about the range of training solutions that we offer. We can also deliver bespoke training specific to your needs.